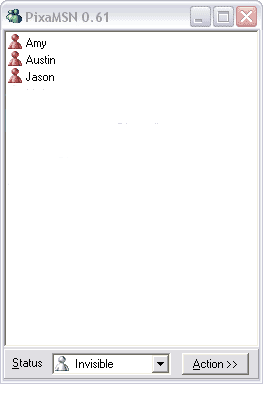 PixaMSN is a portable MSN Messenger client. PixaMSN writes no files to your hard disk or registry so it can be stored and run completely on a portable device such USB flashdisks or portable hard disks. PixaMSN automatically log you in as invisible to other users. Once your logged in, you can change your status to online.